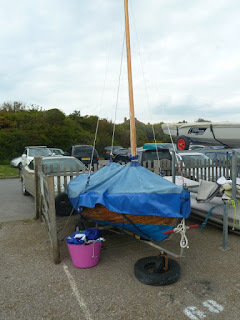 I wrote about Primrose a while ago, she has been hiding in the purpose built shed for the winter, but last weekend she made it out on the water. 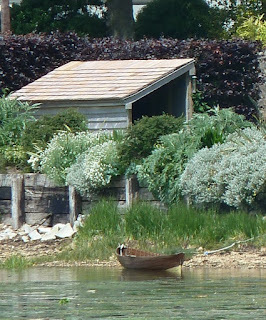 Maybe she was there so that the planks could take up after being ashore, she certainly sits well on the water, it would be nice to see her being rowed and as fellow blogger Doryman pointed out on my previous post, it would be nice to know more about her. 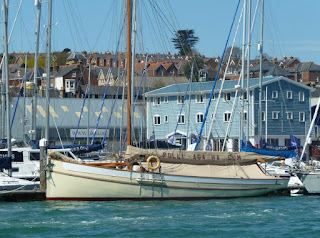 We dropped in at Port Solent last week, we lived there briefly about 15 years ago but it's been ages since we last visited. 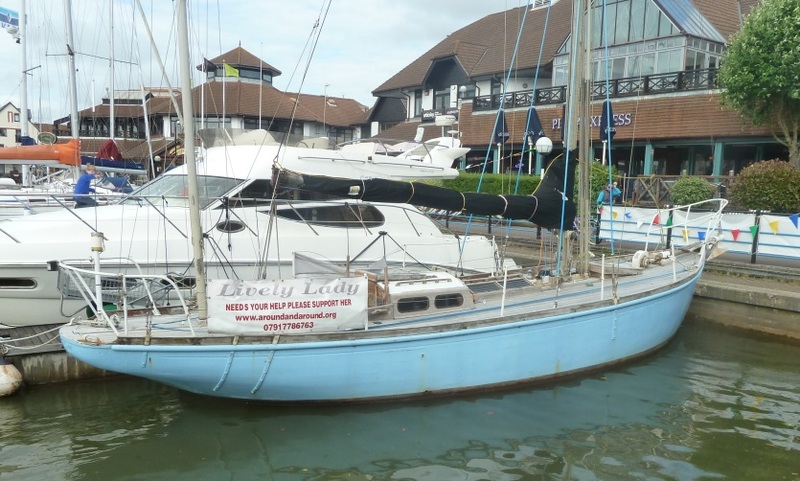 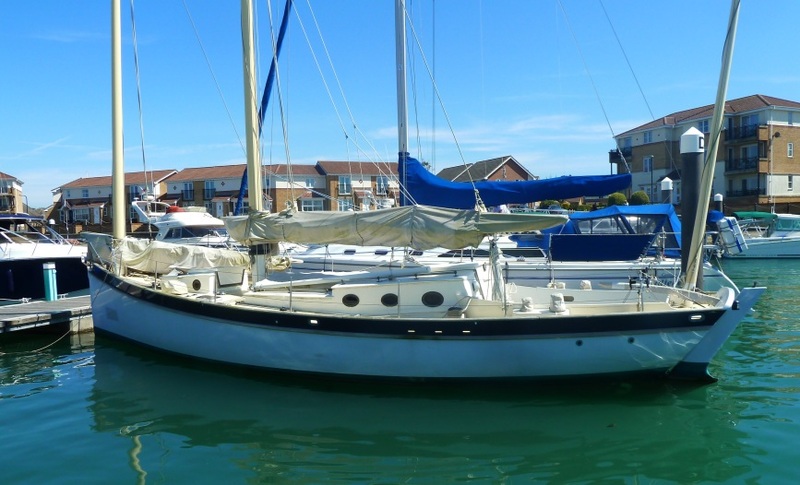 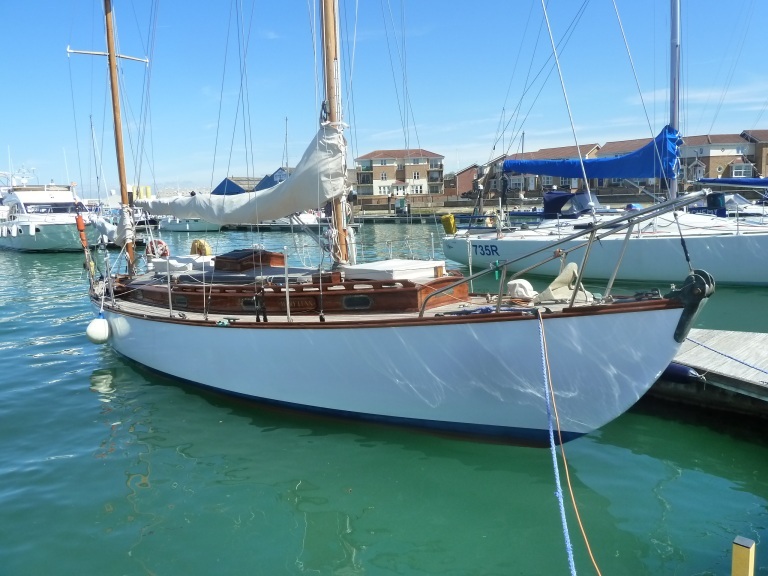 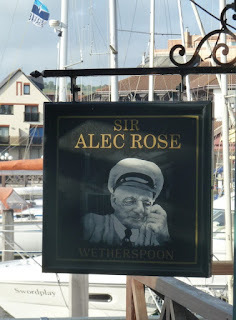 The marina is home to Lively Lady, Sir Alec Rose's famous yacht. 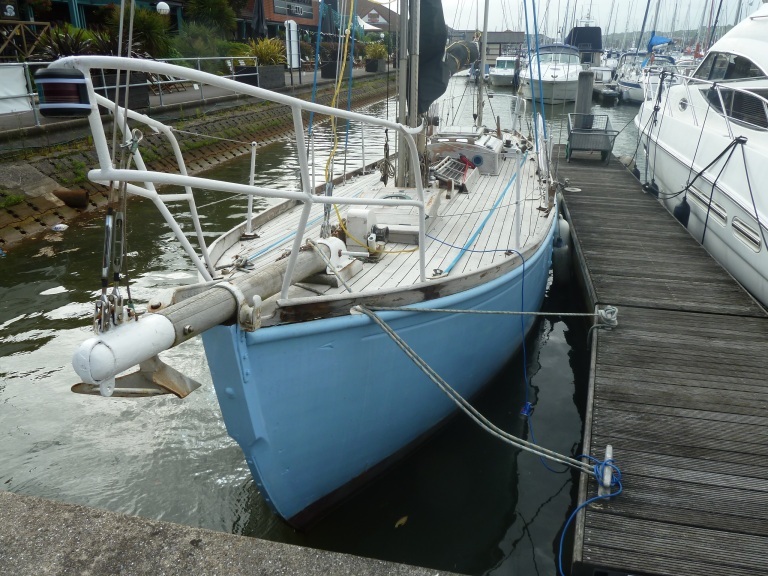 On full view at the end of the board walk, Lively Lady is looking tired and neglected, her bowsprit and toe rails are grey and faded, not a drop of varnish or oil to be seen above decks. 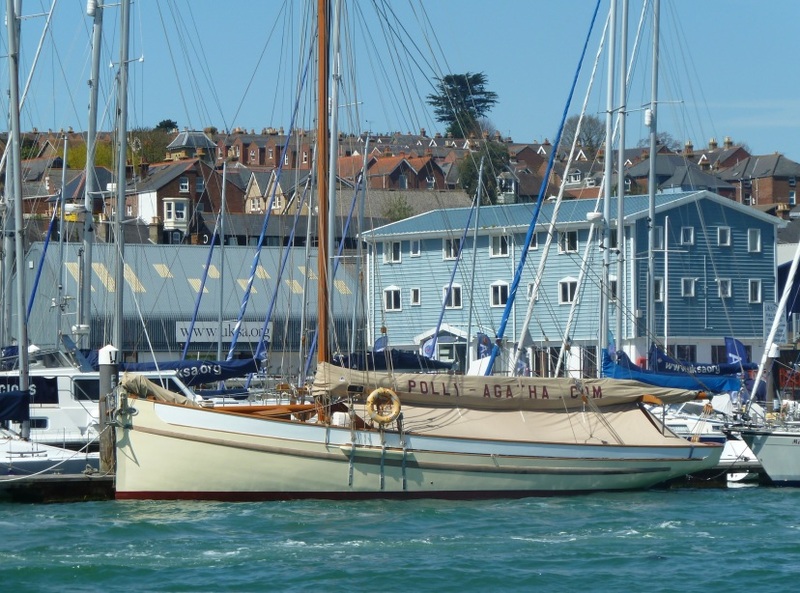 It was a few years ago that we saw Lively Lady with her two famous contemporaries Suhali and Gipsy moth IV out racing in in the Solent, she was certainly in better shape back then. Sir Alec keeps watch from his position at the nearby Weatherspoon pub, he doesn't seem all that happy. 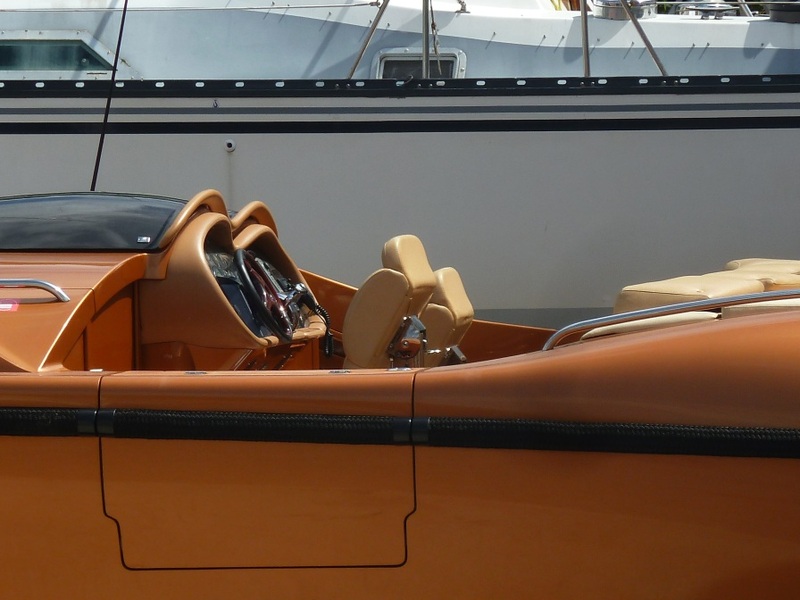 My friend Mark has been talking about buying a motorboat and looking at motorboats but somehow he doesn't actually seem to get around to making his mind up what he actually wants. 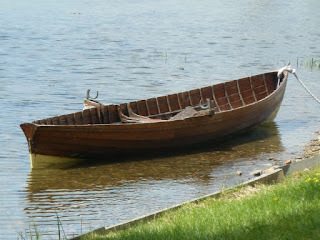 So, Mark how about one of these? 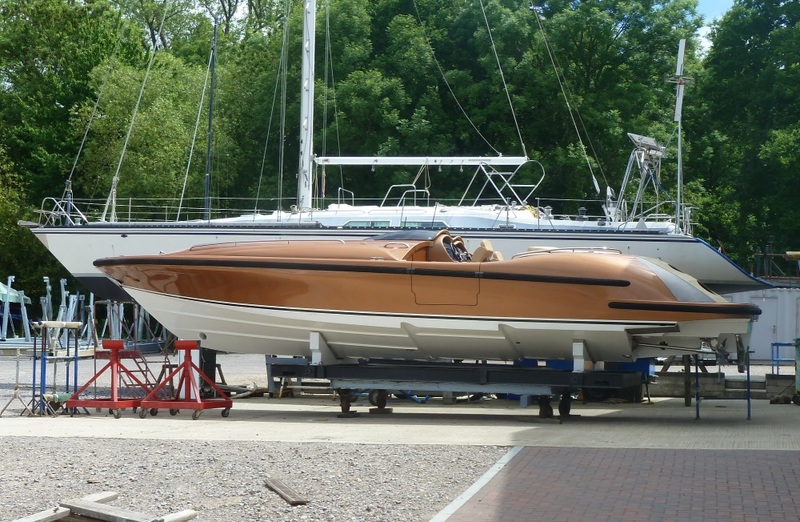 As motor boats go it's pretty impressive and just the thing for popping across to the Isle of White for lunch. Luxury abounds, it even has doors to the cockpit so you don't have to climb over the side decks. Visiting friends over at Shamrock Quay I spotted this lovely gaffer. 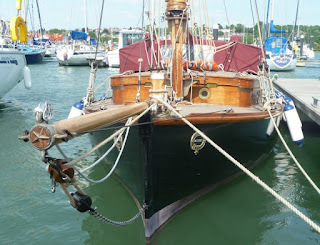 She's quite small around 22 feet, the hull lines are very fair, with hollow bow sections.It's only my impression, the cabin looks like it may have been an addition so maybe she started as an open boat. 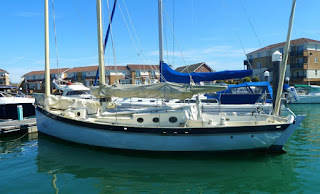 She is certainly well cared for with high quality fittings. Getting details is difficult but from what I can gather the class was conceived and designed by local boat builder Tommy Robertson during the late 1940's, by 1961 four boats were sailed by members of the Hill Head Sailing Club and the class was adopted as the club's One Design at the club's AGM of the same year. 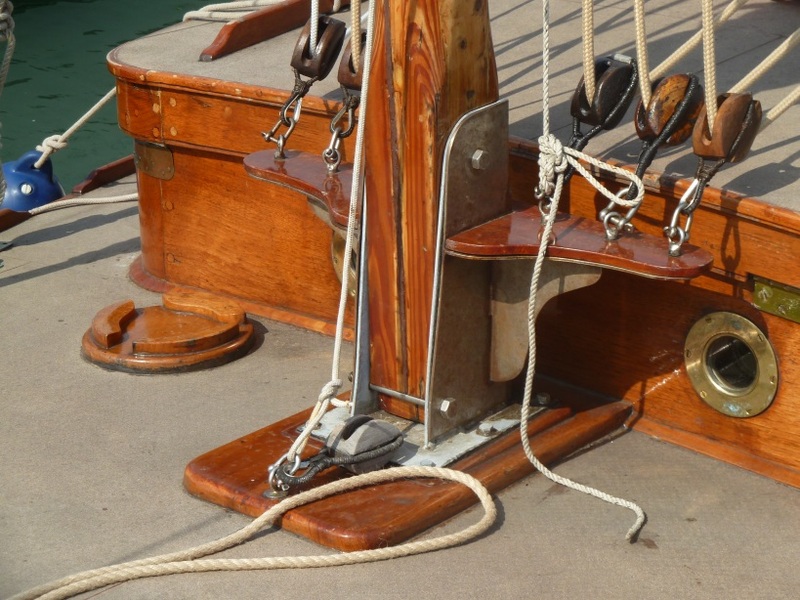 Around 28 boats were built in all. 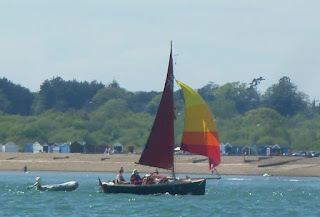 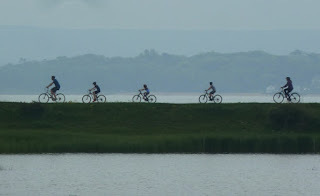 Demanding open-water conditions off the Haven entrance combined with sheltered water inside dictated the sort of centre boarders sailed from Hill Head for many years - steady boats, well-behaved in a seaway, generously-built without the concern for lightness that is important today when so many boats are kept ashore between sails. 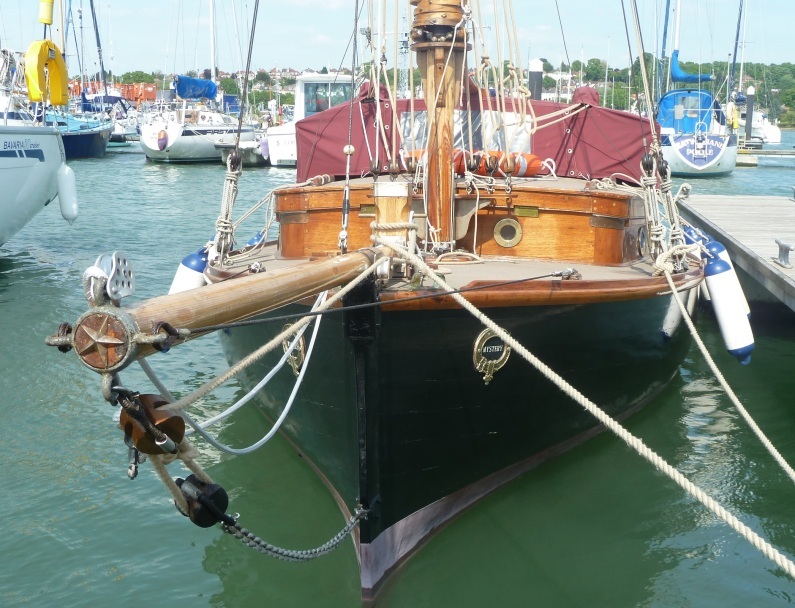 against that background, when Tommy Robertson formulated ideas for a new class of 12-footers for the club in the mid-Forties, he combined the Hill Head tradition for seaworthiness with a boat not too hefty for young members to handle. 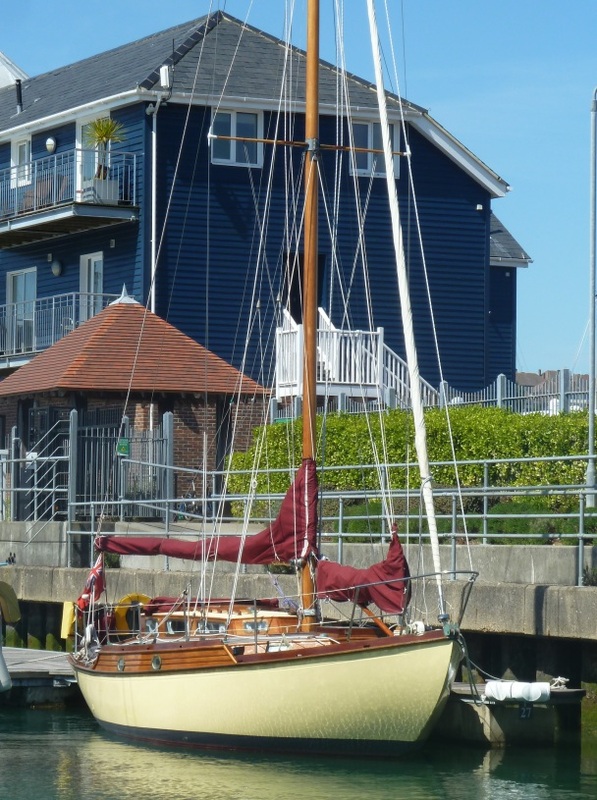 The Jacqueline Class eventually achieved enduring fame - and lots of admiration from visiting sailors - as Hill Head's one and only "home grown" One-Design class. I have to confess for more than a passing affection for varnished, clinker built dinghies like these. 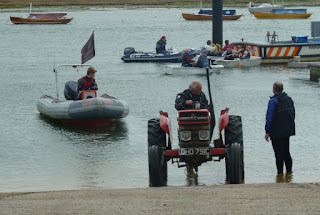 When we were in Normandy last year I was surprised at the number of tractors or varying vintage seen parked in drive ways and garages. 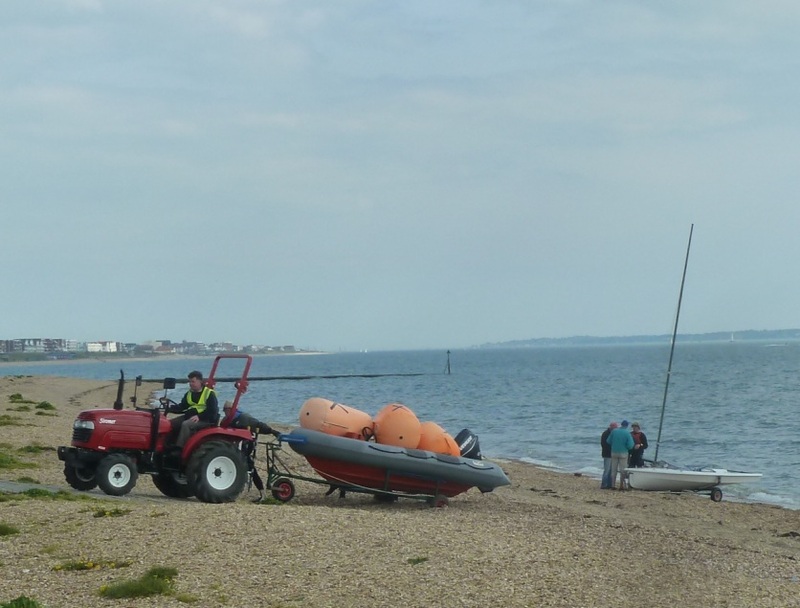 Given the long flat sandy beaches over there a tractor is probably the idea vehicle for launching and recovery. 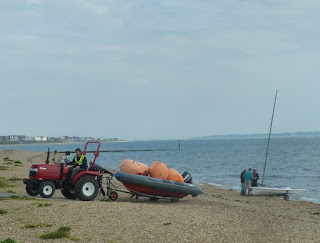 Not as popular locally but I couldn't help noticing a few in use, above Lymington Town sailing Club, and below at the Seafarers Sailing Club who launch across the shingle beach between Hill head and Lee on Solent. All of which got me thinking that a old tractor might be the ideal birthday present/mid life crisis toy for an ageing sailor with too many boats. 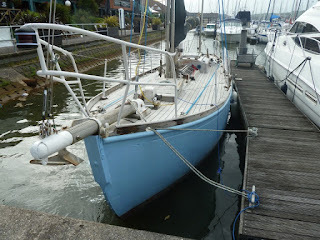 We hadn't been to Cowes since September last year, so it was nice to have a look around at some of the interesting boats over there. 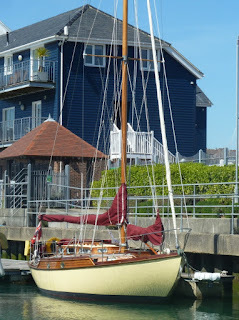 Above Mandamus apparently designed and built by Anderson Rigden & Perkins yard ofWhitstable, launched 1946 and looking immaculate, she seems so have had a long and interesting history including an appearance on Ebay a couple of years ago. 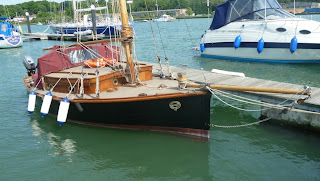 Yawl Mary Lunn a lovely double ender built in Bombay in 1940. 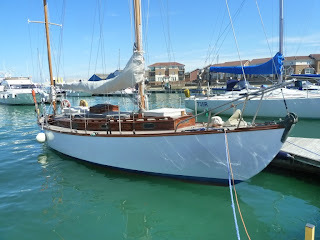 The pilot cutter Polly Agatha visiting from Gunwharf Quays and looking splendid. Nigel Irens designed Roanna of Dartmouth, not quite sure how to describe her, presumably the accurate term is lugger, or is there such thing as a three masted yawl? 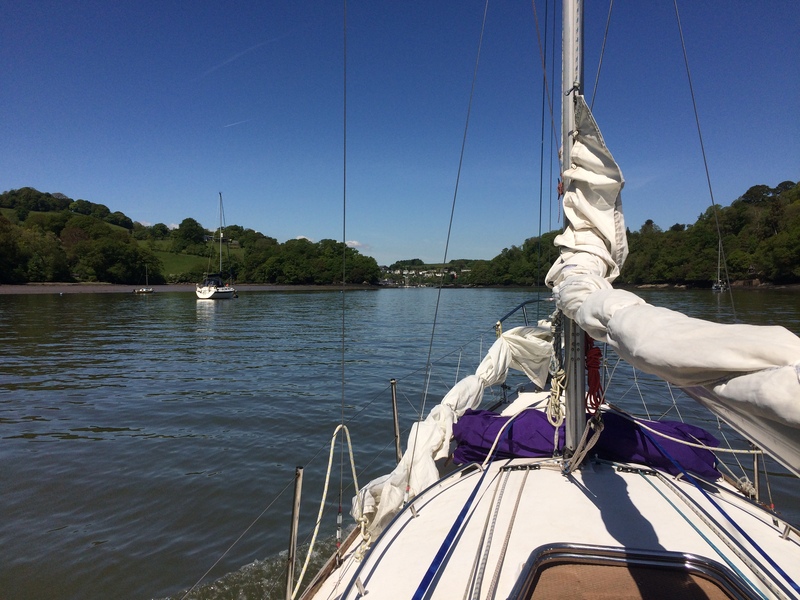 On the way home we were overhauled by a very nippy Cornish Shrimper going really well under spinnaker. 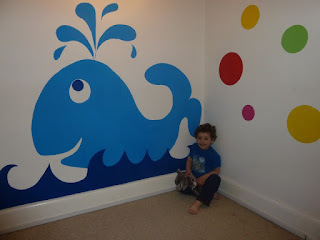 It hardly seems any time at all since I was rushing around at the last minute decorating the nursery ready for Joseph. 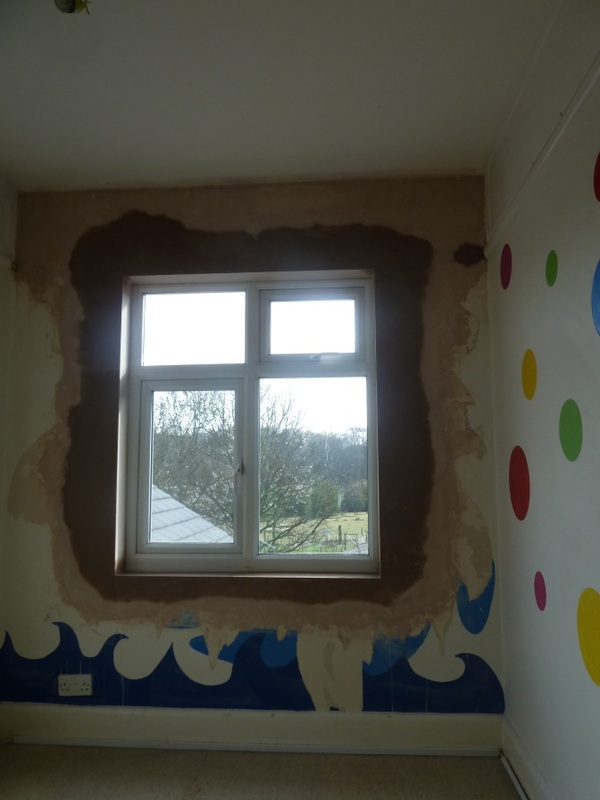 Time moves on, Joseph has moved into a bigger bedroom and sadly Whaley made way for a new window so we can brighten up and convert Joseph's old room into a knitting room for Erica. I do miss the old friendly whale, but there's more than a good chance of some new artwork appearing on the wall in his new room - that is in addition to "crabby" who's recently made an appearance on someone's new bookcase. 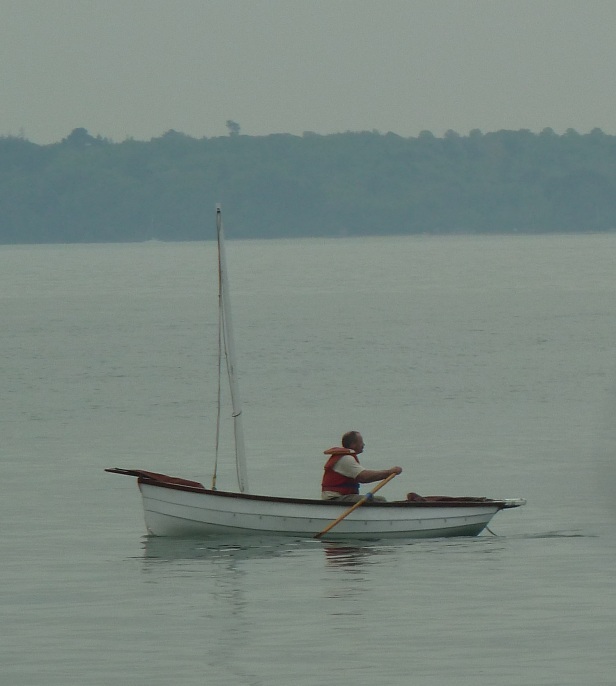 The afternoon breeze had dropped away to nothing, leaving a flat glassy sea, what better time for rowing. 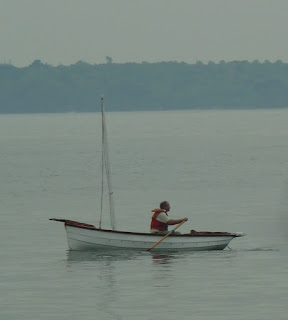 I don't know what the boat is, but she looks about 12 feet maybe less and just perfect for the job.